Sheikh Mujibur Rahman was the founding leader of Bangladesh. His family home in Tungipara, Gopalganj district is located 144 km west of Dhaka. It has been upgraded into a complex containing the grave of the great leader. 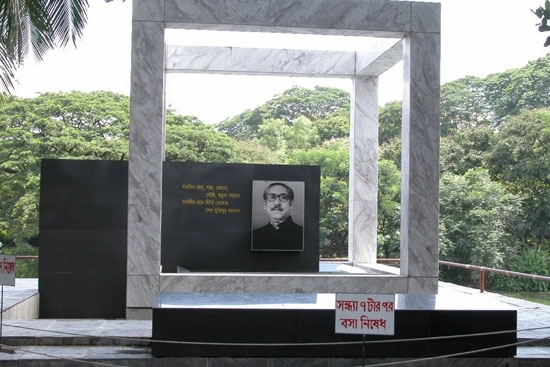 The graveyard of Sheikh Mujib and his parents has been converted into a mausoleum which is visited by a large number of well-wishers from all over the country and even internationally throughout the year. The complex is known as the 'Mausoleum of Father of the Nation Bangabandhu Sheikh Mujibur Rahman' or colloquially as (Tomb of Bangabandhu). It was established on 15 June 2001 by the then Prime Minister Sheikh Hasina. The complex has well-organized space. There is a museum where tourist can see the popular and rare photographs of Sheikh Mujib's life. There's also a small library in the museum. The complex contains a small shop and a large cafeteria for hungry visitors. In a far corner, there's a small open stage which signifies the countless number of times Sheikh Mujib stood up and gave powerful, resonating speeches to his fellow Bengalis. A 200 metre-long straight walkway connects the museum with the graveyard. There's a small pond and a park to the either side of the walkway. There is also lying the grave of Sheikh Mujib's parent Sheikh Lutfar Rahman and Sayera Khatun next to each other. Next, to the graveyard tourists can see the ancestral home of Sheikh Mujibur Rahman where he was born. Tungipara is about 227.5 kilometers away from Dhaka, and it may take about 6 hours to reach the tourist spot through Dhaka-Aricha Highway. After reaching Tungipara, you will find all kinds of vehicles including rickshaws, auto rickshaws, and taxis to reach the complex. There are many hotels and restaurants in Tungiapara Upazila.They are very much cheap and affordable. You will find all kinds of foods and services in these hotels and restaurants. You may consider one of like hotel Jimmy, Kalibari Roadhotel Momotaj,Rail Road Bangabandhu Mazar is a very important historical place, and every Bangladesh people need to visit the Mazar at least once to show tribute to this great human being.